Feast Day - 21st April. The Benedictine Abbey of Sant'Anselmo is located on the Aventine Hill in Rome. As the headquarters of an academic institute of higher studies and of the Abbot Primate of the Confederated Benedictines it is a place that unites within it prayer, study and governance, the same three activities that were a feature of the life of the Saint to whom it is dedicated: Anselm of Aosta, the 9th anniversary of whose death occurs this year. The many initiatives promoted for this happy event, especially by the Diocese of Aosta, have highlighted the interest that this medieval thinker continues to rouse. 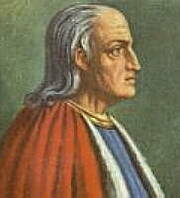 He is also known as Anselm of Bec and Anselm of Canterbury because of the cities with which he was associated. Who is this figure to whom three places, distant from one another and located in three different nations Italy, France, England feel particularly bound? A monk with an intense spiritual life, an excellent teacher of the young, a theologian with an extraordinary capacity for speculation, a wise man of governance and an intransigent defender of libertas Ecclesiae, of the Church's freedom, Anselm is one of the eminent figures of the Middle Ages who was able to harmonize all these qualities, thanks to the profound mystical experience that always guided his thought and his action. 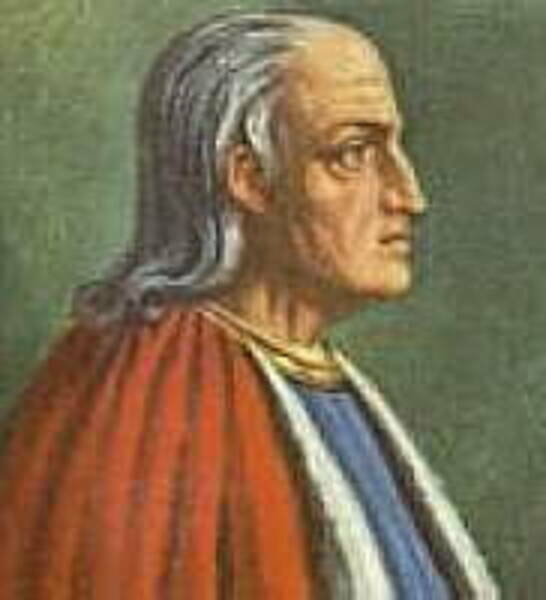 St Anselm was born in 1033 (or at the beginning of 1034) in Aosta, the first child of a noble family. His father was a coarse man dedicated to the pleasures of life who squandered his possessions. On the other hand, Anselm's mother was a profoundly religious woman of high moral standing. It was she, his mother, who saw to the first human and religious formation of her son whom she subsequently entrusted to the Benedictines at a priory in Aosta. Anselm, who since childhood as his biographer recounts imagined that the good Lord dwelled among the towering, snow-capped peaks of the Alps, dreamed one night that he had been invited to this splendid kingdom by God himself, who had a long and affable conversation with him and then gave him to eat "a very white bread roll". This dream left him with the conviction that he was called to carry out a lofty mission. At the age of 15, he asked to be admitted to the Benedictine Order but his father brought the full force of his authority to bear against him and did not even give way when his son, seriously ill and feeling close to death, begged for the religious habit as a supreme comfort. After his recovery and the premature death of his mother, Anselm went through a period of moral dissipation. He neglected his studies and, consumed by earthly passions, grew deaf to God's call. He left home and began to wander through France in search of new experiences. Three years later, having arrived in Normandy, he went to the Benedictine Abbey of Bec, attracted by the fame of Lanfranc of Pavia, the Prior. For him this was a providential meeting, crucial to the rest of his life. Under Lanfranc's guidance Anselm energetically resumed his studies and it was not long before he became not only the favourite pupil but also the teacher's confidante. His monastic vocation was rekindled and, after an attentive evaluation, at the age of 27 he entered the monastic order and was ordained a priest. Ascesis and study unfolded new horizons before him, enabling him to rediscover at a far higher level the same familiarity with God which he had had as a child. "I pray, O God, to know you, to love you, that I may rejoice in you. And if I cannot attain to full joy in this life may I at least advance from day to day, until that joy shall come to the full." This prayer enables us to understand the mystical soul of this great Saint of the Middle Ages, the founder of scholastic theology, to whom Christian tradition has given the title: "Magnificent Doctor", because he fostered an intense desire to deepen his knowledge of the divine Mysteries but in the full awareness that the quest for God is never ending, at least on this earth. The clarity and logical rigour of his thought always aimed at "raising the mind to contemplation of God." He states clearly that whoever intends to study theology cannot rely on his intelligence alone but must cultivate at the same time a profound experience of faith. The theologian's activity, according to St Anselm, thus develops in three stages: faith, a gift God freely offers, to be received with humility; experience, which consists in incarnating God's word in one's own daily life; and therefore true knowledge, which is never the fruit of ascetic reasoning but rather of contemplative intuition. In this regard his famous words remain more useful than ever, even today, for healthy theological research and for anyone who wishes to deepen his knowledge of the truths of faith: "I do not endeavour, O Lord, to penetrate your sublimity, for in no wise do I compare my understanding with that; but I long to understand in some degree your truth, which my heart believes and loves. For I do not seek to understand that I may believe, but I believe in order to understand. For this also I believe, that unless I believed, I should not understand." "Mary, it is you whom my heart yearns to love, it is you whom my tongue ardently desires to praise."